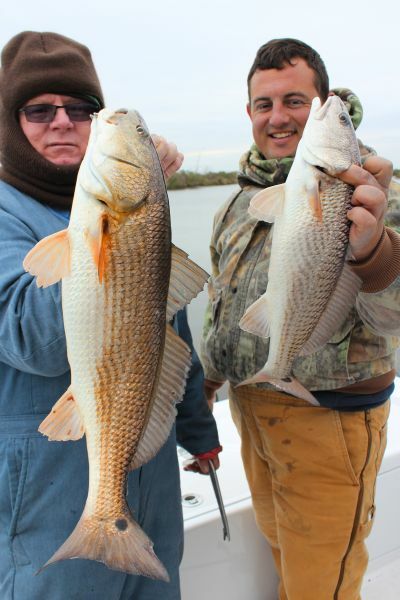 Enjoyed a quick 3 hour afternoon fishing trip this past weekend with Jesse Luquette from Lafayette, La. We started fishing around 2 pm and the reds ate up everything we threw at them. Water temp was right at 49 degrees and it was a slow steady bite all afternoon. We caught a handful of trout as the yellowmouths were having no part of the cold water temps. The reds were covered with leeches as they were hunkered down in the silt trying to stay warm. We caught the fish on a variety of soft plastics as no one bait was the favorite on this day. A few fish were caught on bunker swim baits and chicken on a chain chubs worked well too. It was a beautiful afternoon to fish and Jesse and I had a blast catching easy limits of reds. Good luck fishing. An unbelievable day of catching reds & trout down in Dularge! 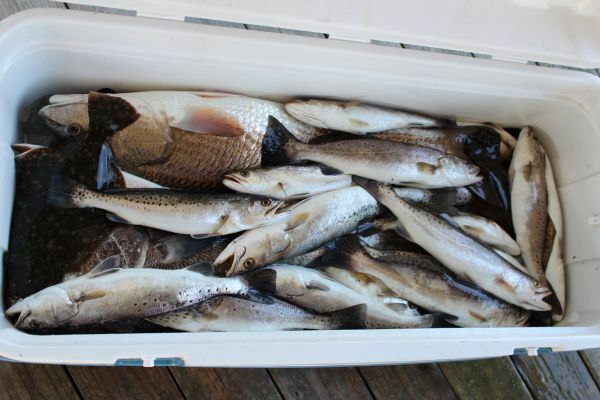 Only fished 3 hours catching 58 trout and no less than 80 fat redfish. Keith Millet and Alex Gravois put the hurt on the fish. A slow retrieve along the bottom in 6-8 ft depths with bunker swim baits and chicken on a chain Bayou Chub Minnows did the job. Water temp was 48 degrees and the fish ate up big time with the trout really resonding in the afternoon as it warmed up a bit. The reds are just silly and can be caught on almost every cast right now. Yes its cold but if you bundle up in layers you will be comforatable and the fish won't let you down. They are thick and hungry!! Good luck fishing. Enjoyed a good day of fishing with Shane Blouin and his 2 young sons from Thibodaux, La. We fished for trout the entire day and found them slow on the bottom using bunker swimbaits. It was a very light tap and the crew had a little trouble detecting a strike. The crew caught trout,reds and a lonely sheepshead. Because of the warmer weather we fished the reefs in the lake catching our first 20 trout in only 2 ft of water. We caught a few more at a second location but when the incoming tide stopped the bite was over. We tried several more locations with no luck at all. Great folks to spend a few hours on the water with down on the DU. Good luck fishing. Day 2 with Danny Hughes and crew started off very slow as we tried another location but only caught a dozen trout. Made a few moves and found what we were looking for with nice fat trout slamming our bunker swimbaits and chicken on a chain Bayou Chub Minnows in only 2 ft of water. They were on the reefs and eating up anything in their path. Caught a few reds and a couple flounder to go with the trout. The guys had to get back early for the long drive back home but not before bringing in another 50 plus fish. The weather is great and the fish are biting ! Booking up now for January and things are looking good! Good luck fishing. 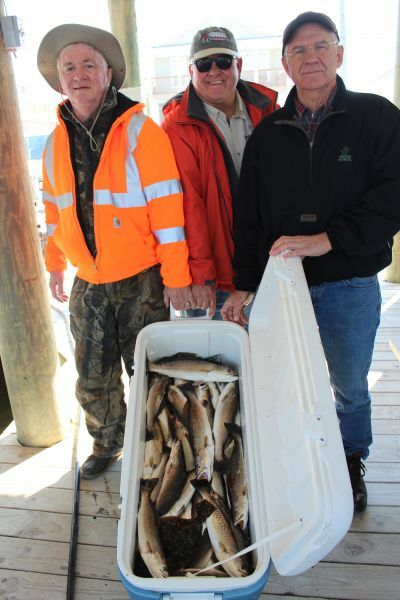 More great trout fishing in lower Dularge! Danny Hughes and his crew arrived from Alabama and were ready to catch some yellowmouths. Thats exactly what we did and the guys enjoyed Day 1 of their 2 day fishing adventure. We found the trout at our first location but it was a slow start. The bite got better by mid morning as we had the yellowmouths coming in the boat from all sides as the warm weather had them eating up big time. Bunker,sea trout and blueback swimbaits did the trick once again. Nothing under a cork as the fish were on the bottom and not suspended. We had 50 plus fish by noon and headed back to the Lakehouse. Big thanks to Capt Brady Giroir for helping out with Ben McKey and his crew. They caught some nice trout as well with both groups having a great adventure on the DU! Good luck fishing. I had the pleasure of fishing with Cliff Lawrence and his good friend Eddie Patterson from Monroe, La. Its been a while since Cliff has been fishing with me as he has been dealing with some health problems. Glad and happy to see hes back on track and slaying the trout. We only had to make one stop as we found the trout eating up our swimbaits in 3-4 ft of water. A very slow retrieve on the bottom did the trick. We could not get the fish to hit anything under a cork as tightlining was the only way to put them in the box. We ended up short of our limit but the quality of the fish was outstanding and no one was complaining. I look forward to having these guys back on the big Pathfinder soon. Good luck fishing. Got a call from Richard Heigl for another trout fishing trip. He could not leave early due to other obligations so we left the dock at 10:30 am. Only took one stop as we had the fish flying in the boat alomost every cast. Bunker swim baits in gin clear water had the trout eating up big time. By 1:00 pm we had our 50 trout on ice and caught and released a few more. The trout were not slamming the bait but rather just a light tap and it was fish on. We caught a couple nice reds too but the trout were what we were looking for! 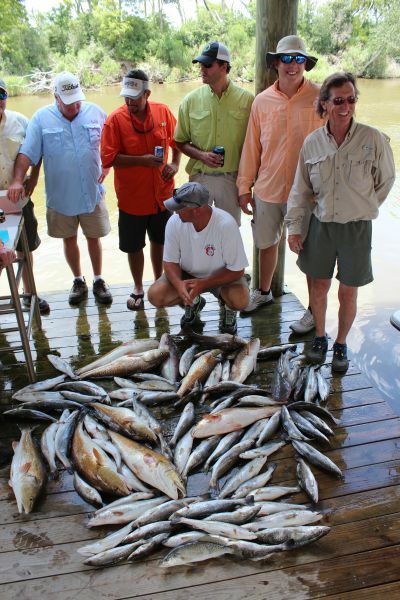 Everyone is getting in on the action as our fishery is second to none here in Terrebonne Parish. This warmer weather has the fish going nuts and its going to continue right on through the end of the year!. Good luck fishing. The fish were boiling the water at daybreak! Fast & furious action for Kevin Ford and I as it was another great morning of fishing the DU!. Bunker swimbaits did the trick with a slow retrieve on the bottom. Our first stop produced about 35 nice yellowmouths before the bite tapered off. We found another dozen or so with a nice red as lagniappe. We enjoyed fishing out of my Pro Drive as the smaller boat enabled us to get in some tight spots. The trout averaged 14-16 inches with a couple 18 in. fish. It has been a great winter bite so far and is making up for a somewhat slower summer than usual. No place like Dularge! Good luck fishing. 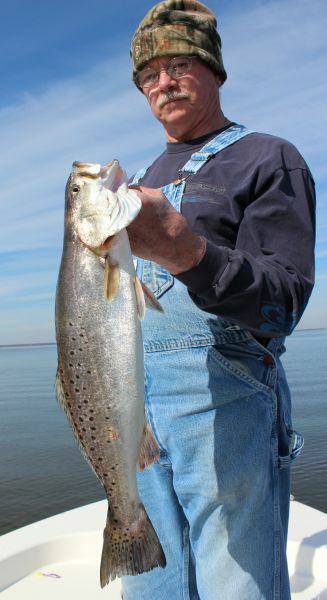 The winter time bite is off the charts this year in lower Dularge. I got a call from Laura Pellegrin from Crowley, La. who was looking for a place to catch trout . I said look no further as her 8 man/woman crew showed up at the Lakehouse ready to catch fish. Capt Brady Giroir helped out with the second boat. Our first stop produced about 35-40 fish but only 20 were keepers. They were eating up the VuDu shrimp under a cork along with Bunker swim baits slow crawled on the bottom. Our next stop produced 2 nice reds and another 10 trout before slowing down. Our third stop was the charm as both boats got on the trout hot and enjoying a fast bite. Bunker and blueback swinbaits had the fish in a frenzy and the crew from Crowley loved every moment. The trout averaged between 14-18 inches and not a single fish undersize during the fast & furious bite. We called it a day around noon and what a trip to remember. Its just amazing what kind of numbers can be put up daily in our area. 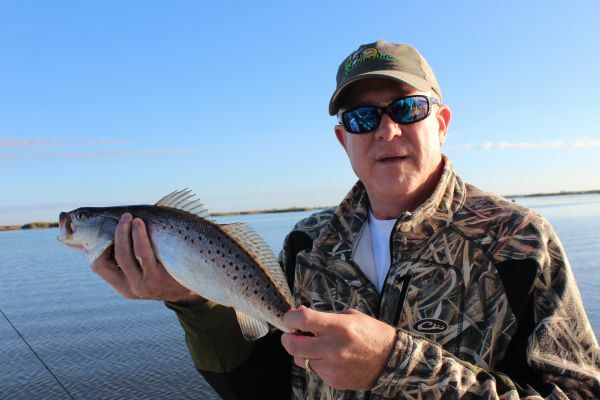 Fishing in Terrebonne Parish is hard to beat and there are not many areas that compare to what we sometimes take for granted. Good luck fishing. Enjoyed a great morning of busting up the trout with Heinke Trapp, Matt Armand,John Trapp and Emzie Armand. We arrived at daybreak and it was on fire from the first cast. Nice trout from 14-18 in. and everyone got on the action . Bunker and blueback swimbaits did the trick just like the previous day. We quickly put 45-50 fish in the box then the tide switched and it was over. Amazing how much of a difference it makes as the trout will only feed on a falling tide at certain areas. We picked up a nice red and a few more trout as the wind started to howl out of the south. We called it a day around 11:00 am with a beautiful box of fish. Good luck fishing. 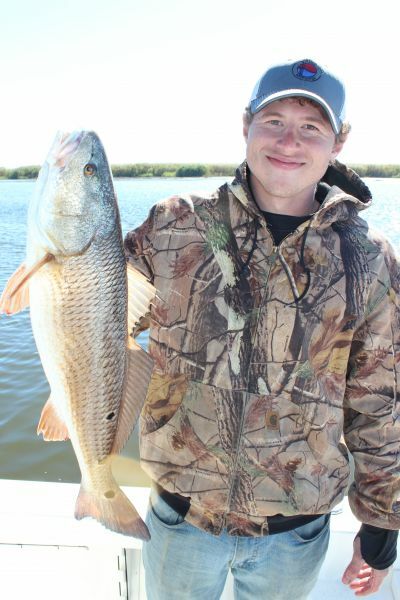 Great redfish and trout action continues down on the DU!. Gary Whitacre and his son Neil joined me and came all the way from Iowa to catch fish. 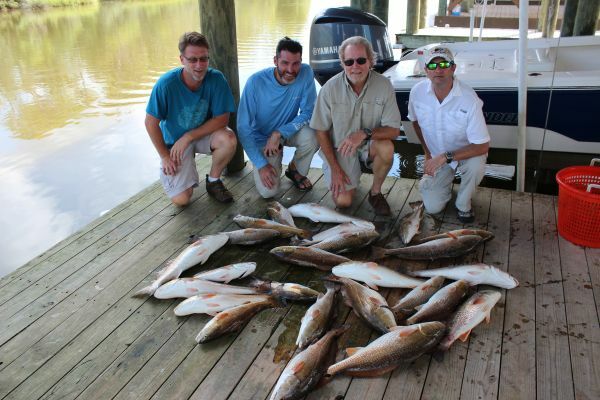 We left the dock shortly after daybreak and the guys were hooking up with redfish and big drum within the first hour. 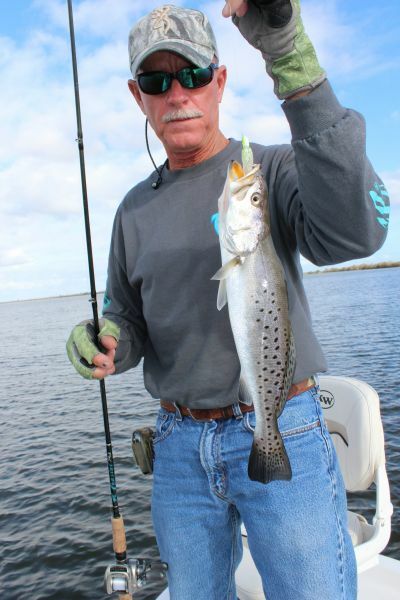 They came here to catch reds and thats exactly what they did here in lower Dularge. We had big fun for the first few hours as we patiently waited for the tide to start falling. Once the tide switched the fun began as the father & son team tried their luck with speckled trout for their first time ever. They loved the fast & furious trout action catching fish 2 at a time on just about every cast. They were here to catch and release but we did keep 2 nice reds for the BBQ pit for their supper at the Lakehouse. 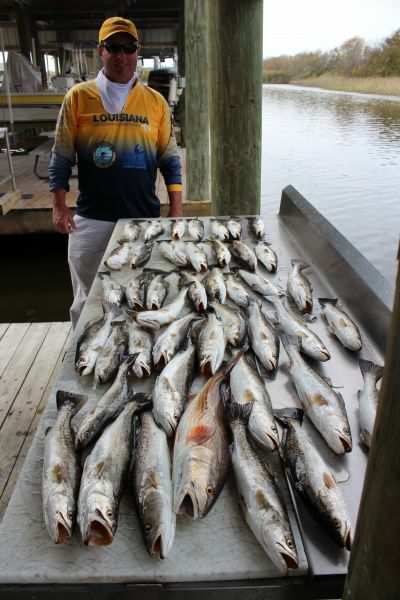 We kept our 75 fish limit on trout as I have family and friends who love fresh fish. Gary & Neil had a great experience and easily caught over 150 fish on their first day on the water. They agreed that there is no place like the DU!. 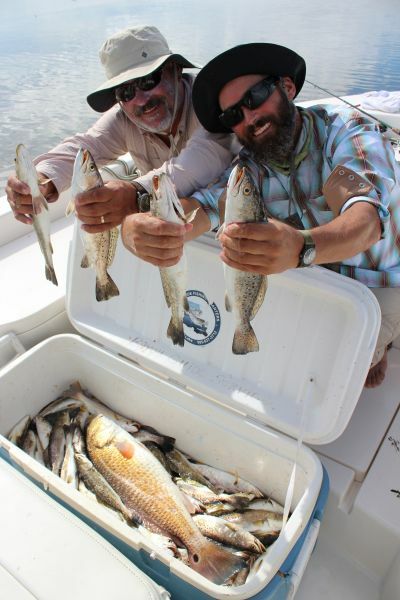 The redfish extravaganza continues on the DU! What a great morning of fishing for my regulars including Tim Haberberger, David Barnes, Brent Houston, Brian Jenkins and Fancher Smith from Tennessee. Tim brought down Fancher for his first trip to the Lakehouse and he had no problem catching his limit of fish. We had non-stop action at our first stop with double and triple hook-ups. It was a lot of fun watching the guys do the redfish shuffle on the back deck of the big 26 ft Pathfinder. I never picked up a pole as the action was fast & furious. Tim and the crew picked up right where they left off last year. The first 21 fish on ice were caught in a 30-40 minute span with the remaining 4 reds caught within the next hour. The fish ate up big time on the rising tide and slowed down after the tide made the switch. We had 1 fish over the 27 in. mark per person and the remainder of the reds averaged 22-26 in. except for three 16 in. fish. It was yet another great adventure for Tim and his crew who has been fishing with me for many years. 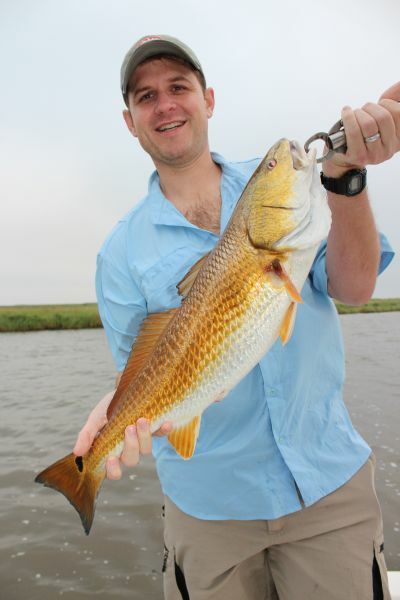 There is no better place to fish than Bayou Dularge located in the heart of beautiful Terrebonne Parish! Good luck fishing. Every day in lower Dularge! September is the month to catch reds!! The redfish were boiling the water this morning on the rising tide eating up everything in sight! Fat and sassy reds anywhere between 16-30 inches. No problem filling our 25 fish limit today. It was an awesome adventure for the 4 professors from LSU. Mark Hafner,Robb Brumfield,Chris Austin and Jake Esselstyn fished with me today and put the smack on the reds. 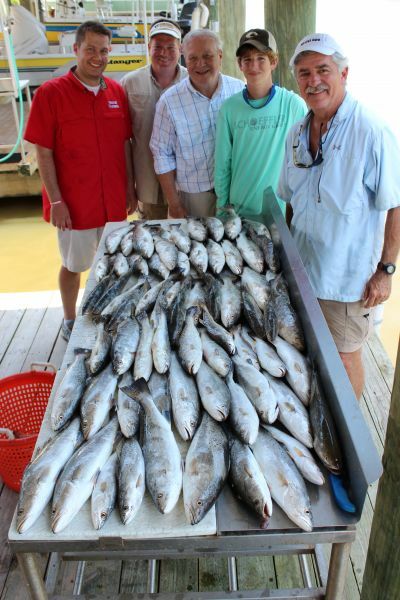 Only had to make 2 stops as we finished up quick around 9:00 a.m. Capt Gerald Ellender and his crew whacked 20 reds for a total of 45 fish between both boats. No finicky reds today as they were hungry!! The blue wing teal are starting to show up more each day in the interior marsh so it should be a good opening weekend. It was a beautiful morning to be on the water in south Louisiana and Im glad my crew could experience what many people only dream about in regards to the terrific redfish bite! Good luck fishing. .After catching 80 trout the previous morning,Chris Tabor and crew wanted to tackle the bronzebacks. Capt Brady Giroir and I headed out with the crew at daybreak and had no problem putting the guys on all the reds they could handle. We found the fish stacked up on an incoming tide and they fed for over 2 hours non- stop. We brought in 50 reds between both boats!. The reds averaged anywhere between 16 in. and 27 in. with the majority around 22-25in. The reds were not all on the bottom as some were suspended in the water column and would eat the bait on the fall. 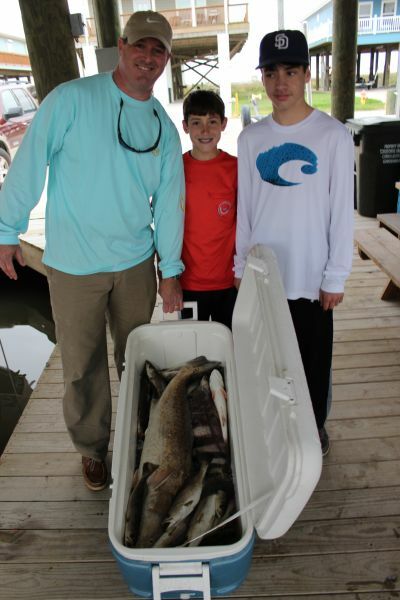 This crew never had so much fun catching fish! They enjoyed their 2 night stay at the Reel In and Shawn Whitneys cooking! These guys cannot wait to get back down to the DU! Good luck fishing. Another great trout slam on the DU! Although we got off to a slow start the yellowmouths didnt disappoint Bailey Kirk and crew. It was windy early but slicked out after the noon hour. We made several stops finding fish here and there before finding the motherload. 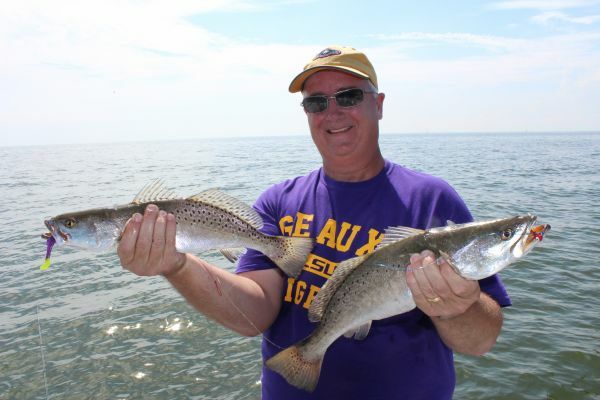 The trout were chasing shrimp and small crabs on the surface and slamming the double rigged LSU Bayou Chub Minnow. Double and triple hook-ups had this crew going wild as they never saw such great action in their lives. As soon as the double rig hit the water it was 2 fish every cast! 15-20 inch fish without a single throw-back! We had no problem catching 100 trout and could have caught 100 more! The guys will remember this trip for the rest of their lives! Good luck fishing. Trout fishing is heating up on the DU! Just finished up a great week of slamming the trout! We're catching them on nothing but plastic with LSU and Glow/chartreuse Bayou Chub minnows doing the trick for us everyday. Steve Jackson,Austin,Bob Marks and Doug Clark had a great time catching some very pretty 16-22 inch fish on the big Blazer Bay! The fish were feeding in a strong current and would hit the double rigs while drifting as they never had chance to get to the bottom. My I Pilot by Minn Kota worked overtime in the anchor position flawlessly as it held us exactly where we needed to be! Sure is great not to have to drop an anchor in such conditions. Only had to hit 2 spots with mostly singles caught at our first location and doubles almost every cast at our second stop. Steve and the crew had a blast as we called it a day before noon. Big thanks to Capt Wendy for the great Camp Dularge experience and to Capt Alden for taking care of Aaron Wood and crew the past couple days! Looking forward to another great week of fishing. Good luck fishing. A great day of trout fishing for my Lafayette. La. crew. 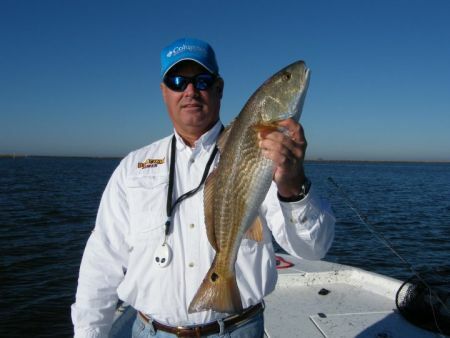 It was trout fishing or bust and it was great to have Poncho Veron back on the big Blazer Bay. A breezy morning to start but it calmed down by mid morning. We did not find a single fish at our first two stops but hit them hard at our third stop. Once we found clear green moving water the bite was on! LSU and glo/chartreuse Bayou Chubs did the trick. The trout were solid 18-22 inch fish and they were hitting hard! The fish were suspended and working a single rigged chub rather than the double rig worked best as the lure didnt sink as fast in the water column. 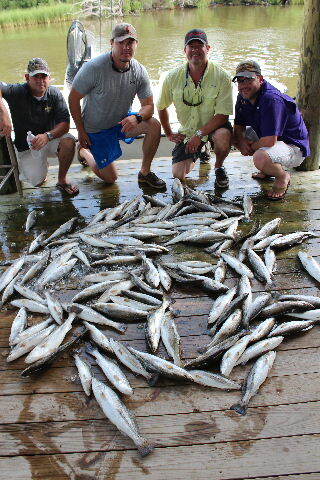 Capt Brady and his crew put the smack on the trout too as the guys had plenty of fillets to bring home! Good luck fishing. Looking to moving on and putting this weekend behind us! It was a terrible weekend to catch trout and thankfully we have a great forecast to get offshore next week. We cancelled all 8 boats Thursday thru today due to the weather and high winds. No one wants to go out in 3 ft seas and fish out of a bay boat and I don't blame them. 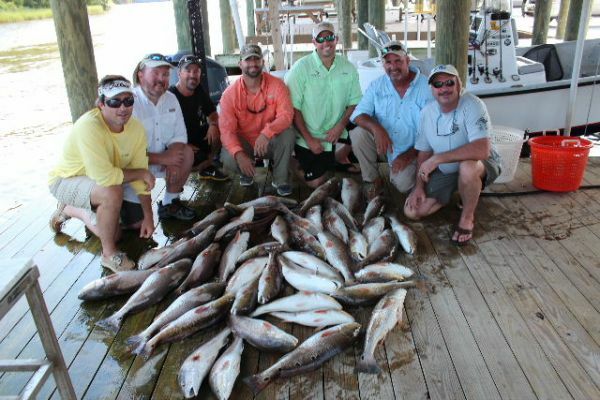 When 90 % of your business is speckled trout charters and we cant get offshore this is what happens. Not one group wanted to catch redfish and I respect their decisions by giving them the opportunity to fish another day. Yes I lose a bunch of money but it comes back to you paying big dividends in the form of repeat business! The fishing was great on Mon,Tues and Wed this past week with hundreds of trout caught as the yellowmouths were eating up big time. Big thanks to Bruce Broussard & crew, Andy Brown & crew,Jim Kirkland & crew for their business. Also I would like to thank Capts Ricky and Alden for taking good care of Stephen McCoy and Alfredo Pinero. Really looking forward to busting up the trout next week. Good luck fishing. Another good day of fishing on the DU! We had 4 boats out on this day with everyone wanting to get out after the trout! We found calm seas and pretty water upon our arrival at our first location. Capt Brady fished with Brian Grona and Carl DeAngelo for their second day on the DU. Capts Rodney & Alden helped me out with the Gaiennie Lumber crew from Mississippi. We started catching fish right away with the trout eating up our live shrimp but the trash fish were doing a number on our bait too. My crew enjoyed the quick trout bite but wanted to catch reds too. We fished plastic but the trout were not cooperative with only 8-10 fish falling for our double rigged chubs. We had 85-90 trout between the boats so we headed in around 9:00 to target the reds. Dan Suillivan and his crew fished with me and they jumped all over the reds at our first stop. Those guys sure preferred to tackle the bronzebacks over the trout and I expect thats what they will want to do on their return trip to the DU! 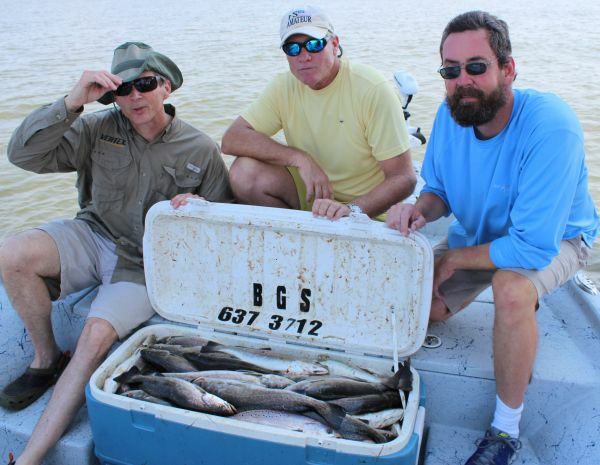 Nobody limited out on the trout but everyone had 30-40 fish per boat. Sure had a great time this past weekend and hopefully our trout bite will improve this week. Big thanks to the Capts and to our customers who we never take for granted!! Good luck fishing. 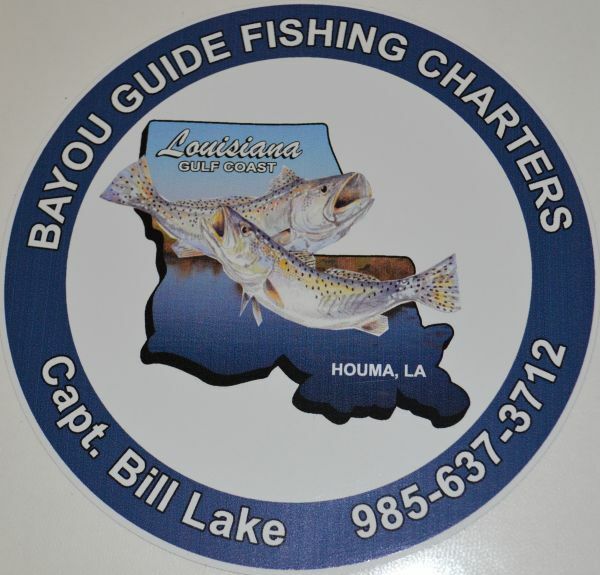 I am the sole owner of Bayou Guide Service fishing charters.